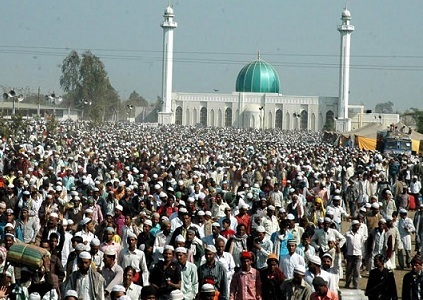 BHOPAL: More than a million Muslims attended the Alami Tablighi Ijtima at Bhopal. The three-day annual event, which witnesses the biggest gathering of Muslims in India, concluded on Monday. The 'dua' or mass prayer in which nearly 14 lakh or 1.4 miliion from 67 countries participated, was held at Eintkhedi on the outskirts of Bhopal. After the 1 hr long 'dua', the Ijtima concluded. The Ijtima at Bhopal is being held for the last secen decades. It started from a small mosque in Bhopal with just 14 people. Later, it shifted to Tajul Masajid, the biggest mosque in India. However, after 2002, it was shifted to Eintkhedi near Bhopal. On the first day, there were discourses by leading clerics asking Muslims to follow religion. There were mass marriages (nikah) too during the Alami Tablighi Ijtima. The local administration puts up special efforts for streamlining traffic during the annual event. Chief minister Shivraj Singh Chouhan had also visited the venue before the Ijtima to inspect the arrangements and had given orders to administration to ensure that the visitors don't face any difficulties.